This one goes out to all you green beans out there. You know who you are, bebe. (Don't ask). 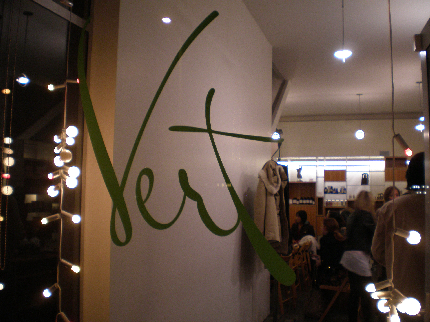 Anyway, ran over to magical Abbot Kinney in Venice on Thursday night to check out Vert (green en francais, which you probably already realized, but let me indulge basically the only French I've retained despite years of classes). P.S. I love just strolling on Abbot Kinney because it almost feels like a small town, where cottage-housed shops, eco-chic design studios and little hippied-out holes are strung with lanterns and white christmas lights. It's forever festive. And Vert is no exception. Founded by celeb makeup artist, Renata Helfman, whose pretty grill (that's face to you fogies) is a living ad for her skills and wellness products, Vert stocks only the swankiest eco beauty lines. 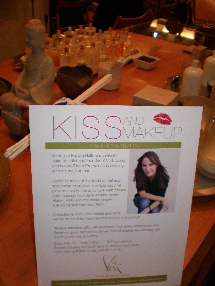 Last week, Renata threw her first "KISS AND MAKEUP" Valentine's night for makeup fanatics to learn a thing or two about the application process. Personally, I don't do well in contained environments (pre-calculus classroom flash backs–shudder), but for those with a patience and a passion for learning, it's pretty cool to get tips from such an expert. When I get my makeup done, I always end up looking like a drag queen (I think it's the way they darken the eyebrows), so I appreciate anyone who can do you up without making you look "dun." While she demonstrated on one lucky guinea piglet (who ended up looking radiant and still like a female), Renata raved about three of her top organic makeup lines: Jane Iredale, RMS Beauty, and Josie Maran. Of course, I could have done without some of the event's vegan chow, which looked pretty, but is–wow–not my thang: I don't need a steak, but can I at least have some gauc & chips in place of kelp and seitan? Seitan (pronounced "Satan"–hmm) tastes like slightly off smoked mozzarella, no? (My Waldoism strikes again, Andrew would say). I'd rather just eat regular veggies, but in yummy form, you know? But that's just moi. 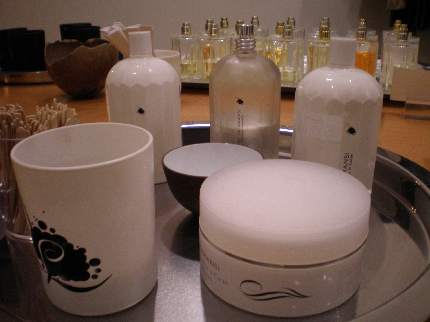 Anyway, if you don't hit up a Renata-led evening, the shop (and new e-commerce site) is definitely worth perusing (especially if you're concerned about toxins etc.) 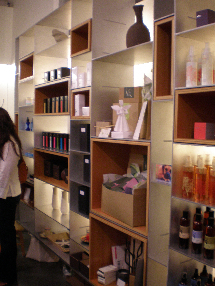 In addition to makeup, Vert stocks skincare, bath & body, hair products and even fragrances in packaging so lovely it practically sold me pre-smell. Crunchy gals sure don't sport patchouli and Patagonia no more. It's all refined and swank in eco-land now. But you already know that. Right, green beans?